If you're like most marketers, you probably think the marketing funnel is where your core responsibilities lie. In fact, most companies have their marketing team own the top and middle of the funnel (visitors, leads and MQLs) and have their sales team own the bottom of the funnel (MQLs, SQLs, opportunities and customers). This transition from marketing to sales reflects the progression of a contact through their buyer's journey. So, what are we talking about when we reference "the pipeline"? 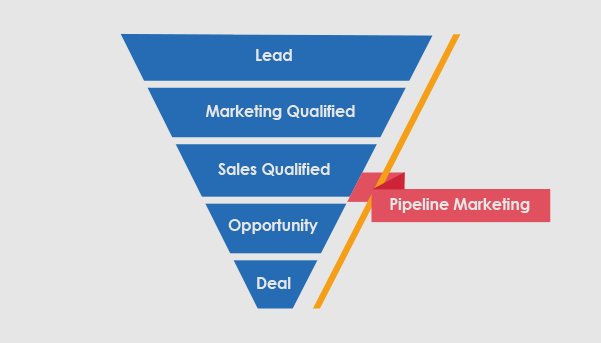 The pipeline refers to the area at the bottom of the funnel where sales opportunities reside. Therefore, it comes as no surprise that "pipeline marketing" refers to the idea of continuing marketing efforts down to where a contact becomes an opportunity — not just to MQL status. As we mentioned, most marketers focus their efforts on visitors, leads and MQLs and then hand contacts off to their sales team. But what differentiates an average marketer from a good marketer? A good marketer continues providing value and instilling trust in their prospects through the entirety of the funnel. This is the idea of pipeline marketing. The buyer's journey has three main stages: awareness, consideration and decision. Think back to the last purchase decision you made and what led you to that purchase. The process probably began when you realized you had a problem, but you weren't sure of the best solution. Here, you were in the awareness stage. After recognizing your problem, you probably went online and started researching different options to resolve your problem. For example, maybe you looked at reviews for different product offerings to gauge their performance. There, you had entered the consideration stage. After doing some research, you narrowed down your options, and you reached out to the two or three companies that have the products that interest you the most. After evaluating your options, you finally made your purchase, ending the decision stage. By providing your prospects with a specific case study regarding their industry or a great testimonial from a happy customer, you help verify that your skills and expertise match what you have promised during the sales process. Unlike a traditional marketing strategy, pipeline marketing requires a more individualized approach. When prospects are in top of the marketing funnel, the goal is to help them become aware of a problem and educate them on how you can help them solve it. There are also a lot more contacts in the top of the funnel, so traditional marketers tend to work more at scale and may rely on marketing automation to help them educate those prospects. This isn't the case at the bottom of the marketing funnel. There are far fewer opportunities to reach out to than there are leads, so your approach needs to be more individualized. Let me be clear, you shouldn't be relying on marketing automation in pipeline marketing. When marketing to your contacts in the pipeline, the content they engage with should be tailored to their specific company, which renders your automated workflows useless. In traditional marketing, you're selling to multiple people at once. In pipeline marketing, you're selling to a specific person or company. If you're not already leveraging pipeline marketing, the first step you can take to start initiating this approach would be to identify what type of content resonates with your personas at each stage of the buying process. This content will differ from company to company. At New Breed, we use blog posts and guides as educational content for contacts at the top of the funnel, or the awareness stage. We leverage case studies, assessments or demos for those in the pipeline when prospects need more substantial evidence that our offerings are a good solution to their problem. What relevant case studies do we have for each of our buyer personas? Do we have testimonials that speak to each of our services? Are there reviews of our company on any review sites? What do they say about us? Can we provide a prospect with a tangible example of our product? Like a product demo or assessment? Once you identify the content you have, you can identify the gaps in your strategy and put a plan in place for filling them with fresh, relevant pieces. Last, it's critical to remember that your pipeline marketing campaign should be perfect. Not good, not great, perfect. Your campaign is targeting a much smaller group of prospects who are already familiar with your business and brand. They've invested a lot of time in you and you've invested a lot of time into them if they've become an opportunity. This isn't the time to make a mistake that will reflect poorly in their purchase evaluation. When working in the pipeline, double-, or even triple-check that follow-up email to your prospect and then have your coworker take a look at it as well. But it's more than just checking every minor detail of your campaign. The other important element is the hyper-personalization. When contacts reach the pipeline, you should know them so well that it's flattering yet borderline creepy at the same time. You should be tailoring your content to each individual client with specific details about their company. (This will make it even worse if you accidentally send the email to the incorrect contact!) The more ways you can personalize the content you send to your pipeline contacts, the more confidence they will have in your ability to achieve their goals. Pipeline marketing demonstrates why your marketing efforts shouldn't end at a given stage of the funnel, especially as we transition into the era of the marketing flywheel. While once a linear process, the buyer's journey is now seen as a never-ending cycle that places equal emphasis on your prospects and customers.